Planning a car camping trip? Want to make sure you’ve got it all on board? 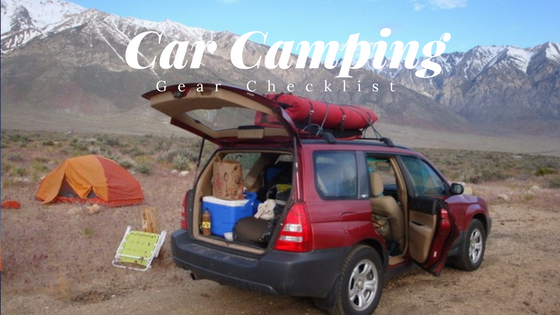 Our essential car camping list can be your checklist the next time you hit the road. I am fresh out of the car from a great camping and climbing trip to Bishop, California, so I thought I’d round up what we brought, along with some tips on packing and staying organized. As you can see in the picture above (taken at the Horton Creek Campground), we filled up my Subaru (with 2 crash pads taking up lots of the space), but used every bit that we brought. Car camping is all about comfort; don’t be afraid to bring a few extra luxuries you wouldn’t pack when full-on backpacking. All of these products are available at Tahoe Mountain Sports in Truckee, California or there are links to buy them online. FULL MESS KIT – Go ahead and bring the full monty for cooking, why not? A SnowPeak Cutting Board with Knife, a Coleman double burner camp stove, a coffee press, a double-wall mug, a kitchen towel, a tupperware to act as both plate, bowl and daypack sandwich holder, stacking utensils and a Snow Peak cookset are my essentials, but I expand that to include much more depending on the length of the trip. COOLER – Stocked with ice, of course, for perishable items (we know you won’t forget the beer, but don’t forget the creamer for your coffee). FOOD – No dehydrated anything if you don’t want – you’ve got a deluxe camp kitchen! SUN SHOWER – This is a car camping essential in my book. Hook it to your hatchback, or set it on your roof top or a tree branch. Camp showers range in price from the basic Coleman Solar Shower to the deluxe Nemo Helio Pressure Shower. 5–7 GALLON WATER JUG – When you live in a place with as good of drinking water as Tahoe, no other water will do. Plus, this is the best way to easily refill your water bottles and pots for cooking. We recommend a durable water jug like the Reliance Aqua-tainer. CHAIRS for lounging around the campfire. FIREWOOD – Annoying to pack, but way better than buying a bundle for $6 from the camp host. TENT – Size doesn’t matter at the campground, so bigger is better (like the Nemo Wagontop 4 Person Tent) for sitting up in and fitting in the pup and her dog bed. SLEEPING PAD, BAG AND PILLOW – Go ahead and sleep as comfy as possible when weight is not at a premium. I use the Nemo Cosmo pad with pillowtop for a bed-like base, a Kelty sleeping bag, and the big pillow from my bed. LANTERNS/HEADLAMPS I really like the Black Diamond ReVolt Headlamp because it’s lightweight and very bright. I always bring along a few Luci Lanterns too. They are great for camping because they are solar charging and pack down small. PAPER PRODUCTS including toilet paper, paper towels and moist towelettes if you really want to get fancy. Plus garbage bag and ziplock bags are very useful. SHOES FOR CAMP – If you don’t have to stay in your hiking boots 24/7, then why on earth would you? I like to pack my Chaco flip-flops as well as some comfy camp shoes, like Vans, that are easy to slip on and off, yet will keep your toes warm. GEAR for whatever sport you’re doing – with all the extra packing you’re doing, don’t forget the most important items: like crash pads, daypacks, climbing gear, fishing poles, etc. Once you’ve got everything in order, the next step is to pack strategically. DAYPACK – I go ahead and get my daypack packed with whatever essentials it needs (Sol sunscreen, lip balm, energy bars, rain jacket, etc) so it’s pretty much ready to go. It’s also important to keep things organized throughout the trip. CLOTHING – I like to have a his/hers side of the car; we usually keep our clothes bags behind the driver and passenger doors for easy access. KITCHEN – Key too is a tidy kitchen set-up. Try packing all your food in one bag or large tupperware, then have another for all the pots, pans, cutlery, etc. This makes it much easier to find everything. What’s on your car camping list? Let us know in the comments! We’ve actually got Sunscreen in the daypack section above, but sun protection is important!